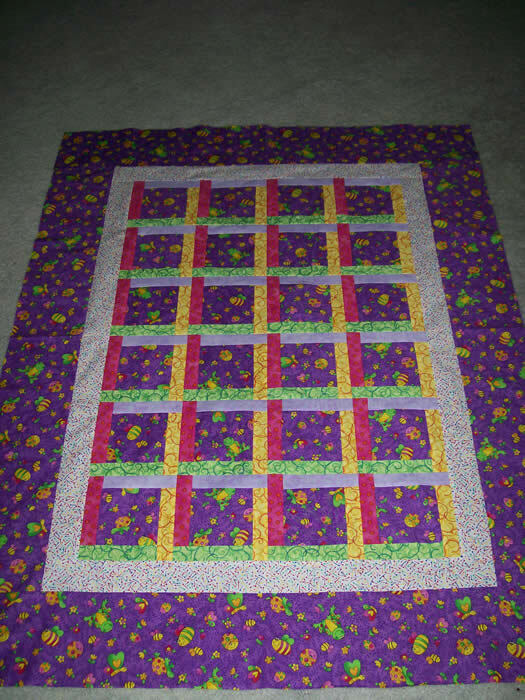 This project can be made in a number of sizes and although there is no actual “block” structure, instructions will be available for the different size quilts. This project works well out of your stash for the weaving and a dark background and border helps make the quilt come to life. This design looks amazing when colour blending your strips from dark to light for both directions. 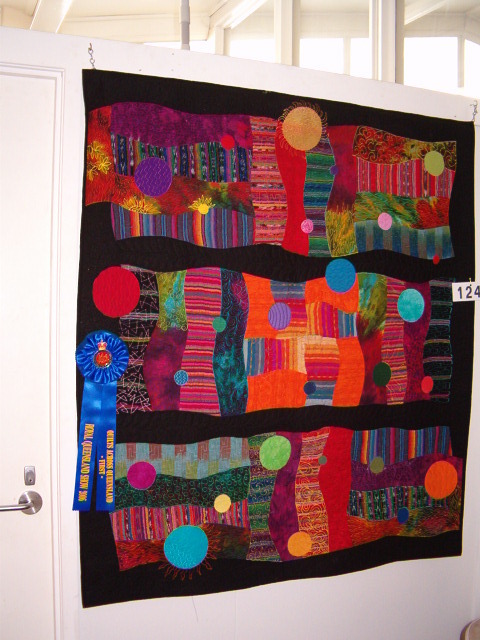 This quilt is part of Points at Play series that Jan has designed around the half rectangle units. 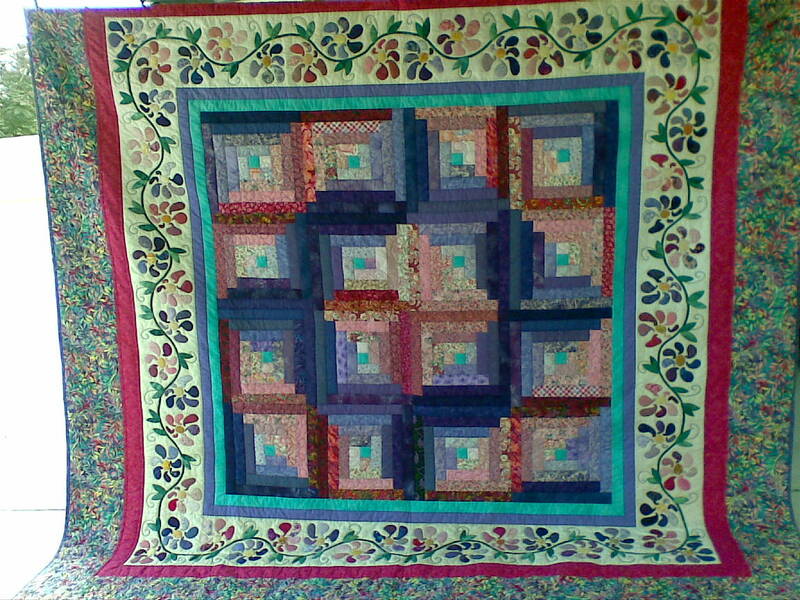 This quilt is suitable for a 1 day class where 1/2 the quilt can be done, with all sizes and techniques covered, or a 2 day where it is possible to complete the quilt top. 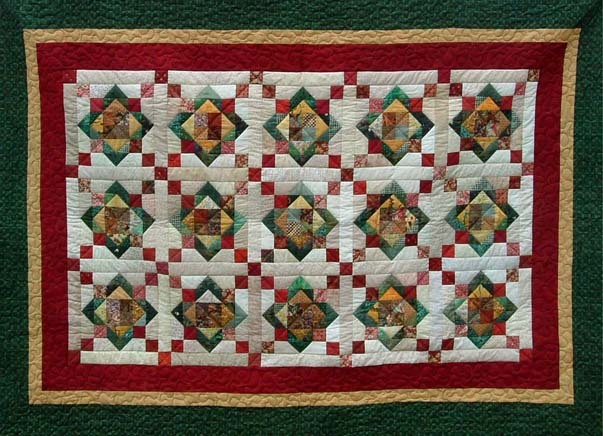 Several sizes of the pieced units are used in this quilt and Jan uses a trim down technique and regular rulers for this project. This workshop uses larger pieces, makes 4 big blocks and can be finished with a plain border to enhance the centre. Two different star blocks feature in this design. The top is quick to make, and can be made in your favourite colour theme, or try it from your scraps for a multi coloured look. This quilt uses a modified, simpler version of a traditional block, the Card Trick, and is a quick, fun quilt to make. 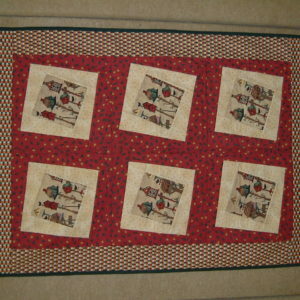 It is sampled as a cot quilt however more blocks could turn this into a fun quilt for any age. 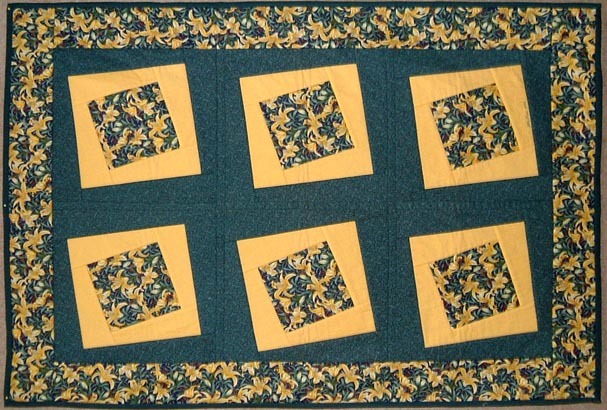 This quick little quilt can be made in any size – sample is a cot quilt. Great for featuring a favourite fabric and the sashings weave between the blocks. This workshop shows an easy way how to inset blocks into a background with a random placement. 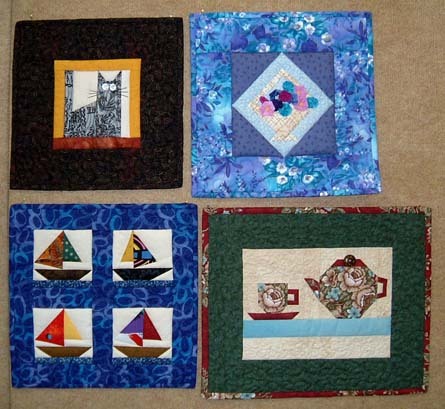 Fun blocks or great fabric squares can be used in class to make a table runner or wall hanging. 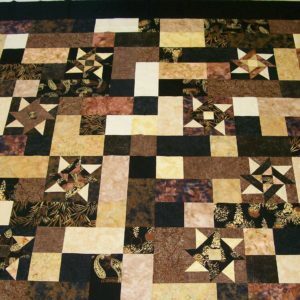 This workshop explores the freedom of curved piecing without rulers and piecing without a 1/4″ seam. 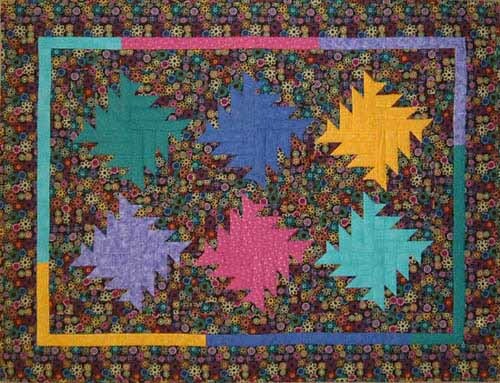 A great way to create landscape scenes or contemporary quilts, or add a different style of border to a more traditional block – many applications – lots of fun. 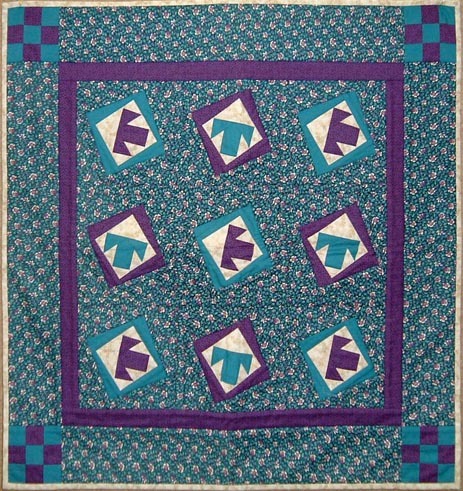 My sample was made using a large range of Guatemalan and commercial fabrics, however I have created a simpler format for the workshop, enabling students to learn the techniques and often a complete quilt top is made in class. 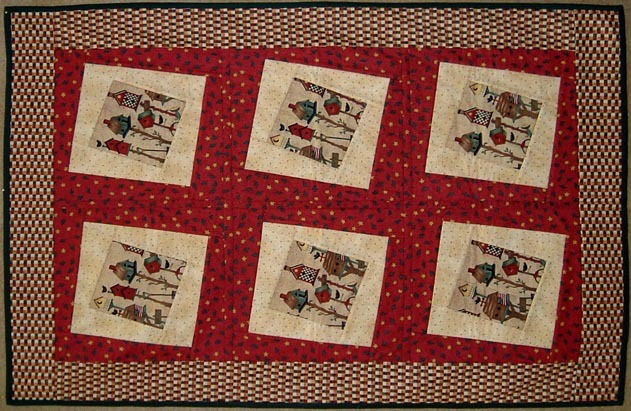 This workshop teaches the style of quilting I used on my freedom quilt. I have found that students have been able to learn this method easier than regular free motion and although this style is not suited to all quilts, it can add texture and interest and helps students build their confidence. A fun day creating on a blank canvas. This quick quilt is made with only three fabrics – a main that is perfect for special prints like Japanese styles – plus there is a dark and light print to compliment it. The layout styles are many, and for students to get help with these this can be taken as a two day class. Suited to all skill levels. This workshop uses a quilt-as-you-go technique to make a fun table centre. Great for featuring two themes- e.g.- Xmas one side, every day the other. Suited to all skill levels. In & out binding also shown. 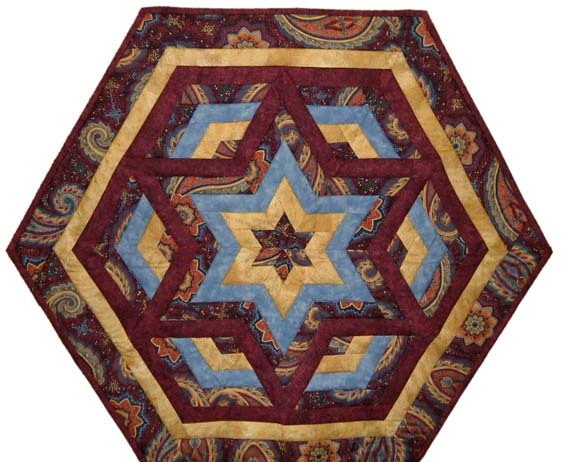 Create a wall hanging or centre medallion for a larger quilt. 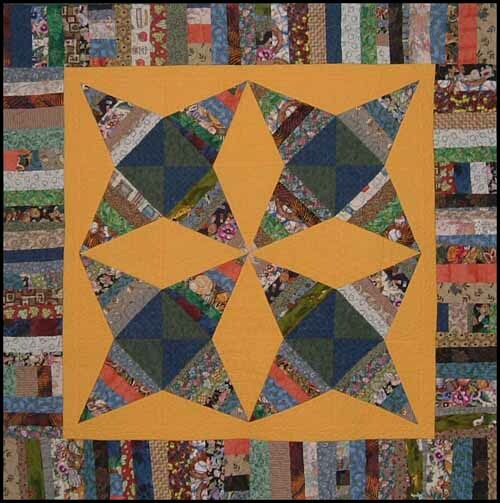 This workshop uses rotary cutter techniques including angles and as you make the eight point star, learn the skill of handling the bias seams and setting the corners. Design suits colour bar fabrics, 2 colours only or even scraps. A great workshop for new quilters where you learn to make a cushion. 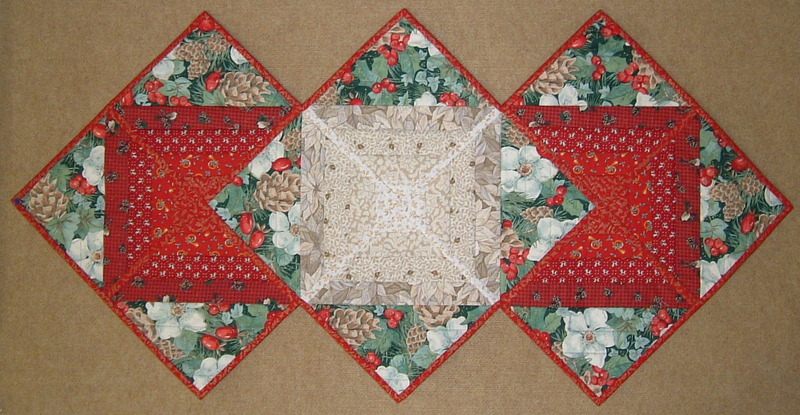 A cushion block or wall hanging that can also be repeated for a larger quilt. This workshop uses rotary cutting techniques creating a star within a star design. Suitable for those new to rotary cutting and quilt making. This is a workshop featuring mitred corners, and is designed for rotary cutting. 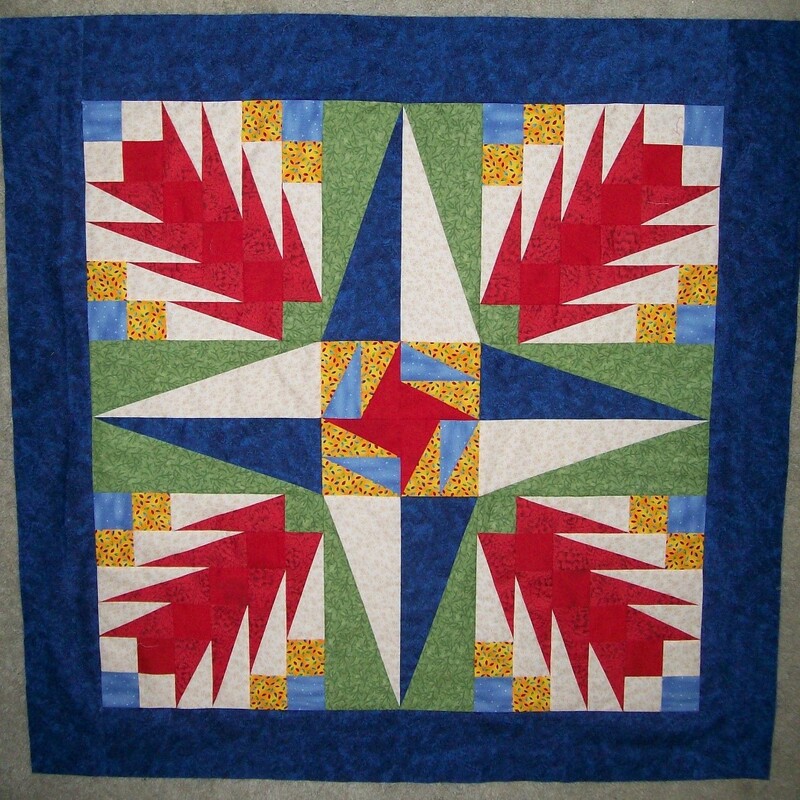 In class make a pieced cushion size block or wall hanging where pin wheels rotate around the block. Repeat the design for an interesting quilt. Some piecing knowledge best for this design, but not essential. This workshop gives plenty of practice at cutting and sewing straight seams. 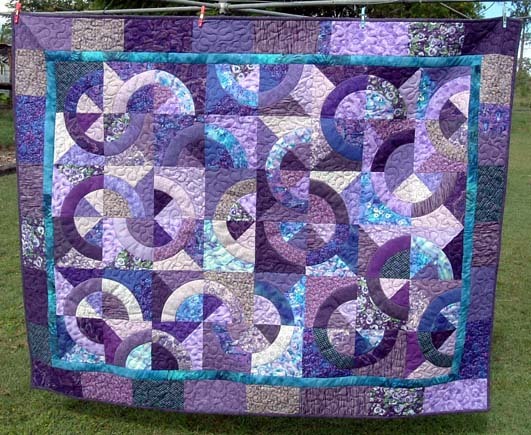 Learn the basics of this creative wave design where each quilt looks different. 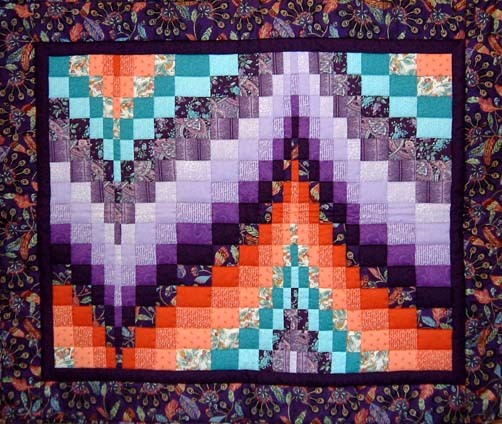 Make a wall hanging size piece of bargello in this workshop and complete it for the wall, or include it in a jacket or bag, or expand on the design later and turn it into a larger dramatic quilt. Pre-cutting required. 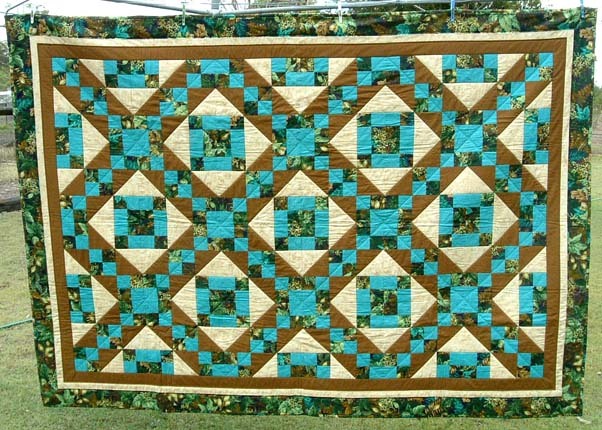 This workshop teaches the speed piecing technique to create a traditional log cabin quilt. 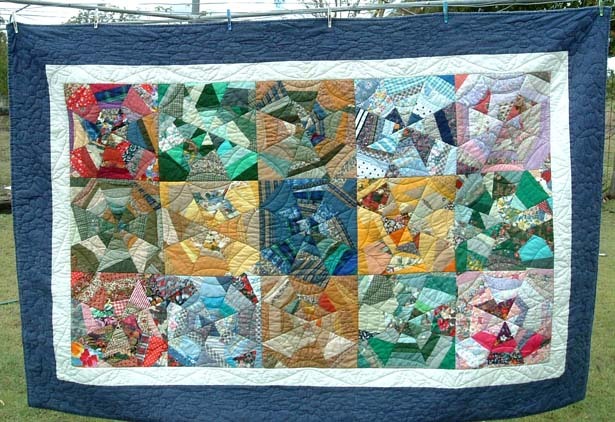 A cot size top can be achieved in class, or make more blocks at home for a larger quilt. Fabric quantities are given for several sizes. 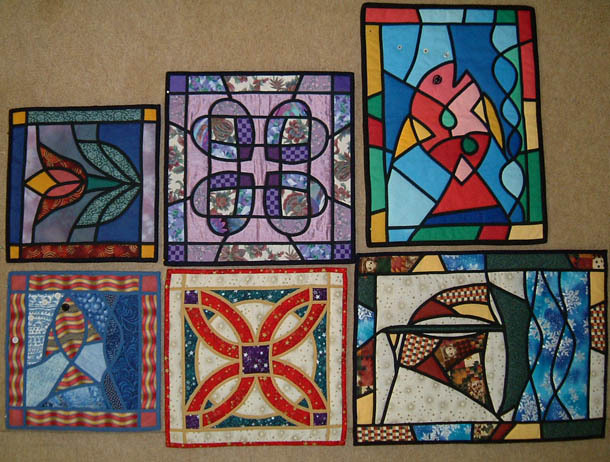 Different settings are discussed and different quilting options. Learn the accurate method of foundation piecing starting with simple designs and working to more complex. At home turn your work into a bag or machine cover, or make quilt labels, or small quilts etc. 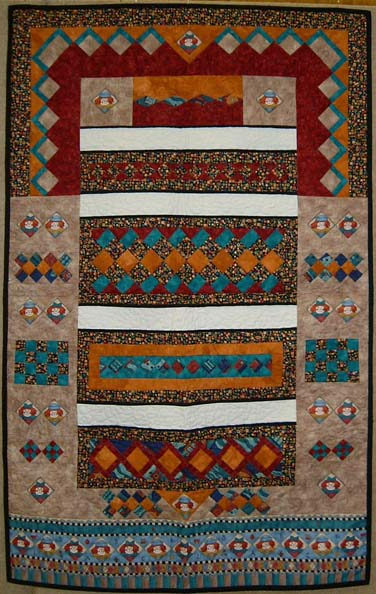 This technique has many applications for small or large quilt designs and different types of foundations will be discussed. Get in Touch today to check availability of workshops and classes. This workshop is designed for those people who like the stained glass effect but prefer the faster results of machine work. A small size sample is worked on in class. Use my designs, or bring a small one of your own. 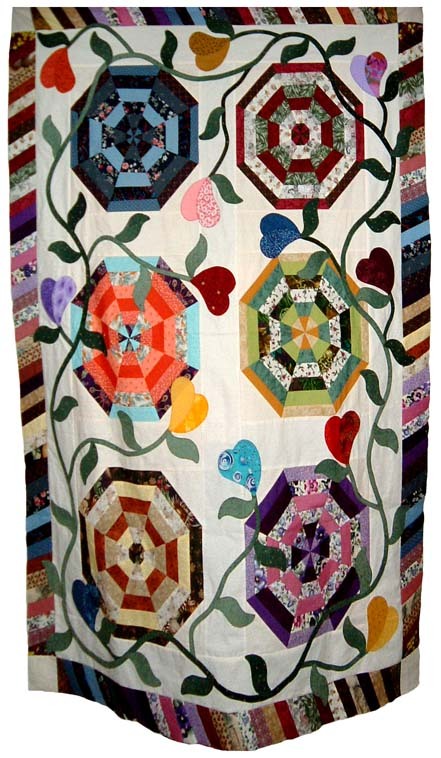 This fun block is a great way to use odd size pieces from your scrap box to create a colourful quilt. 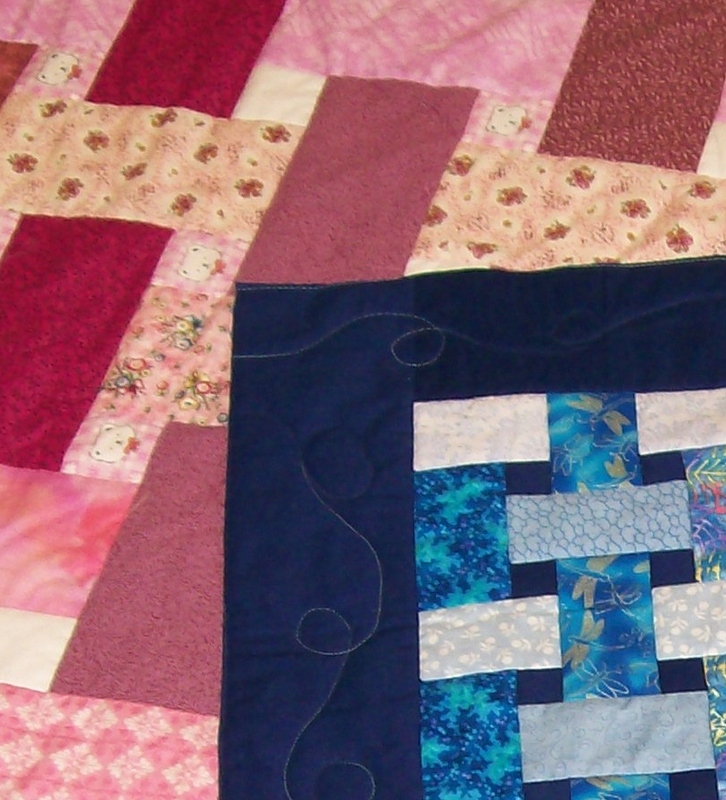 Make blocks as you get more scraps, then later complete the quilt. 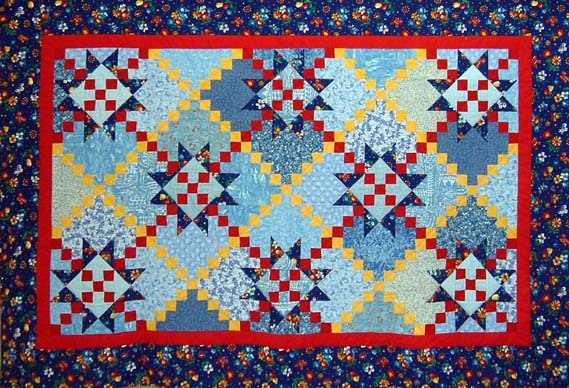 Learn different ways to change the quilt by introducing plain fabrics for stars. 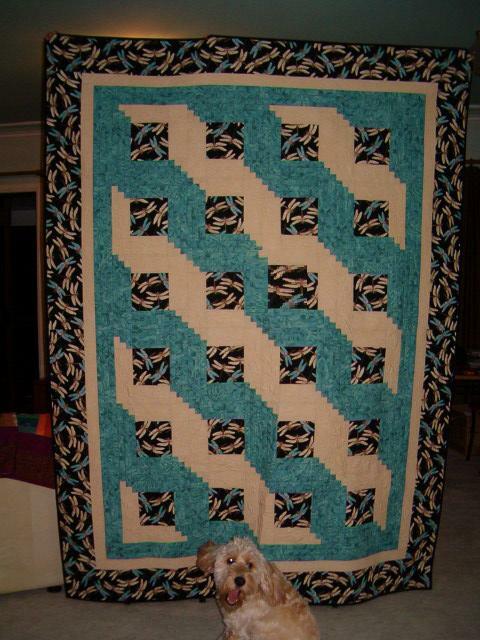 This is a machine pieced workshop designed to create a wall hanging or small quilt in a ‘quilt as you go’ method. There is no extra quilting needed in this project and when each completed block has been joined the project is ready for binding. The centre squares are set in twisted layers to form the block. 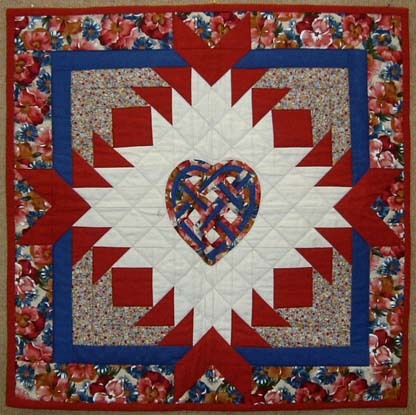 The centre can be a feature piece to display cross stitch, appliqué, crazy patch, signatures, photos or special themes, or the whole block chosen to give a different theme to each side of the quilt. The finished project size will depend on size and number of blocks chosen. The larger size is best used in workshop samples. 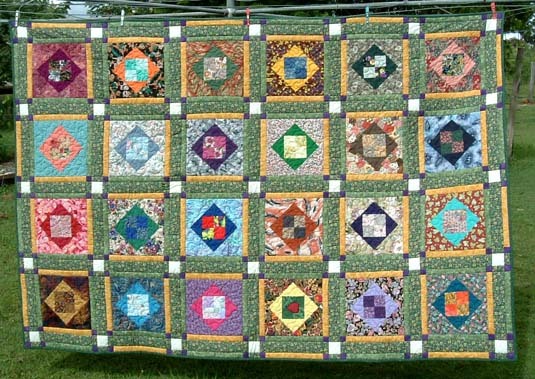 This is a great quilt top to make using an “old favourite” block called Aunt Sukey’s Choice, and is a great design for a scrap look, or a single colour theme using different values. Make a smaller project like a table runner for Xmas. The workshop has pre-cutting requirements to enable a greater amount to be achieved in class. This is a workshop that concentrates on the techniques of sewing simple curved seams by hand. Extra blocks such as Drunkard’s Path and Orange Peel can be made using this technique. 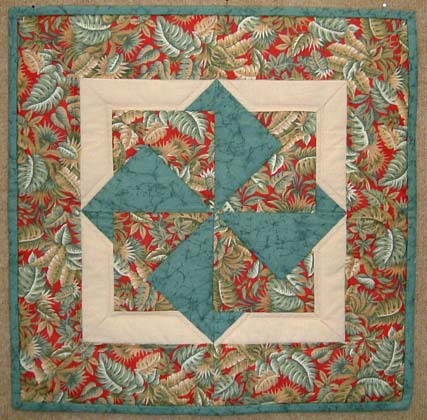 Enjoy the relaxed nature of this project as you make the quilt or learn the technique only on a block – it is up to you. This wall hanging features cornered log cabin blocks which can have a dimensional or flat look depending on the method you chose. The blocks create a frame for a central design of your choice – I have a Celtic style heart design, you may prefer a different appliqué. 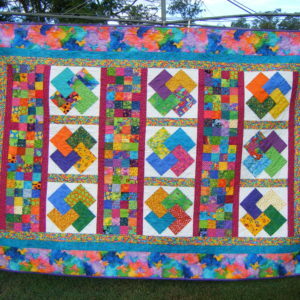 A larger quilt can be made using this technique, however requirements are for small size only, which is achievable in a one day workshop. 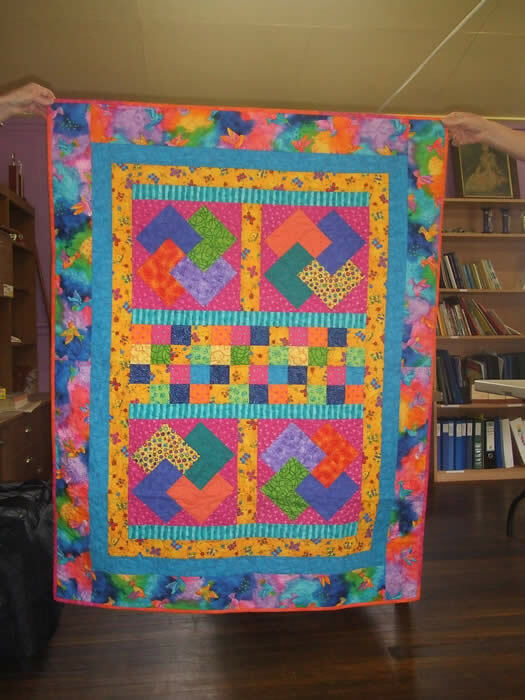 This workshop has proven popular for people who want to do their own quilting on manageable sized pieces. This workshop explores 6 different ways that pre-quilted sections can be joined to make a larger quilt. Both hand and machine techniques are covered, and students work on a sample of each method in class. Seminole is a series of bands of fabric of different conformations that are cut and repositioned to create many interesting designs by varying the number and widths of the strips and the angle and widths of offset positions when joining. Using these techniques try different small sections and turn them into a sampler collection in a folder, a strip sampler quilt or use them in gift ideas – towel decoration, ruler bag, needle holder. Seminole designs make fabulous borders and the scale can be adjusted to suit the size of you project. 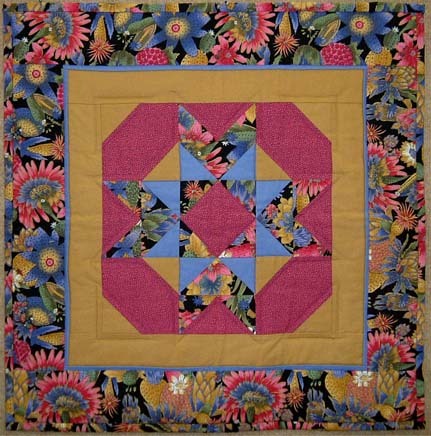 This workshop covers foundation piecing and hand or machine piecing of miniature blocks, plus buttonhole appliqué and folded flowers. This workshop is suitable for all skill levels. 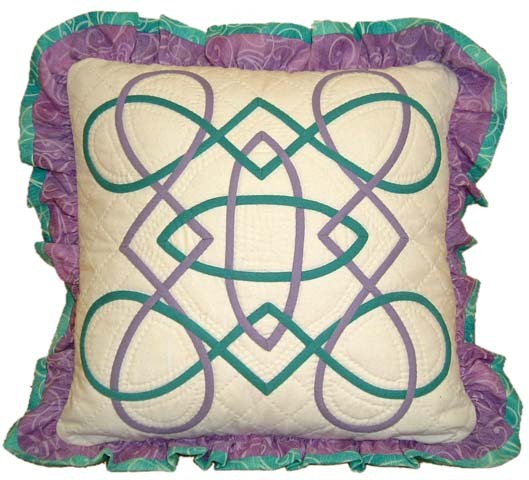 Make a cushion block in a Celtic design from one of two designs available. This class shows how to transfer designs, create the bias using several options, allowing a multi-coloured fabric to create interesting effects. The class covers how to form the Celtic designs and an appliqué design is then placed in the centre of the framing. 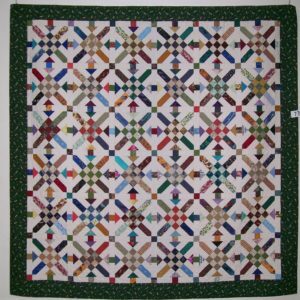 This workshop takes you through the marking procedures, sandwiching the quilt, then on to machine guided quilting. 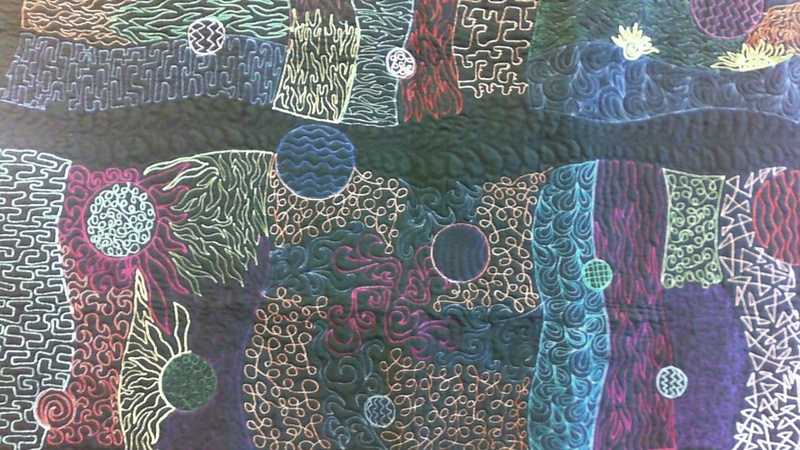 By the end of the lesson you are starting on free motion quilting including stippling. In this workshop we create some pieced diamonds then re-cut them to create different patterns of colour. More than one size option is given for fabric selection and to allow for different skill levels. You may prefer to make a smaller wall hanging in Xmas colours or a larger table cloth or make this as a medallion in a larger quilt. The final shape can be hexagonal or add to it to make a square or rectangle quilt. The smaller size very achievable in workshop time. 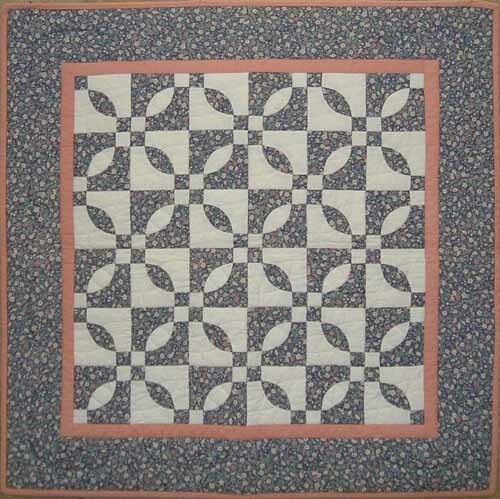 This workshop shows how to make a pinwheel style block for a very quick quilt. 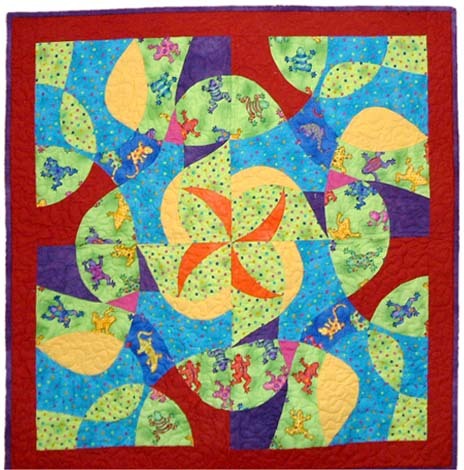 It can be multi-coloured in each pinwheel, or an individual colour in each pinwheel, or simply make a 2 colour quilt where all the pinwheels are the same. The blocks are 15”, so the quilt grows quickly. A great design for children or adults, and great for gifts. Requirements are for several sizes to suit your needs. Quilt top only. In a one day lesson, learn how to draw your own geese block with varying size and direction of the geese in the design, then learn how to piece into a background. We make one block in class that can be a table mat, cushion block, or part of a larger project. This block can have a plain background or learn the extra technique with the strip background. 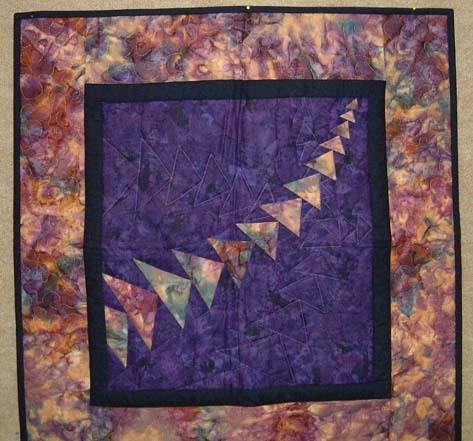 This workshop is a one day workshop designed around the technique of piecing curves accurately using freezer paper techniques. Create your own repeat block design or bag, or use mine. This method can be used in such things as landscapes, abstract designs or more specific shapes e.g. flowers etc. Combinations with other techniques e.g. Strip or crazy piecing, can create interesting secondary patterns or backgrounds for appliqué. This workshop features the Ohio star set with two different coloured chains across a multi-coloured background. The background could be washed from dark to light, or use as a mottled effect. Skills in cutting & machine piecing. Quilt top only. This workshop uses the kaleido ruler to create striped and plain units that make up different patterns such as the star sample. It is a fun workshop that you can plan your colours for, or simply use a little more of that stash and have a great scrap look with only 1 plain colour. Machine piecing – a little previous piecing experience is best. 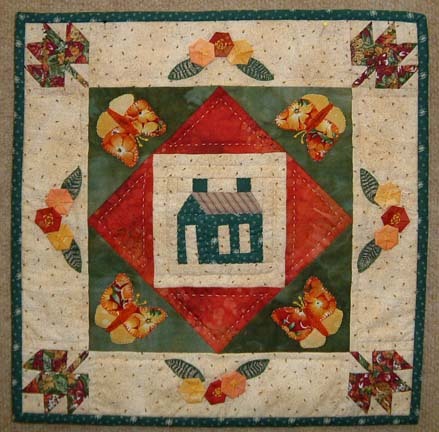 This is a quick project using machine piecing and appliqué. 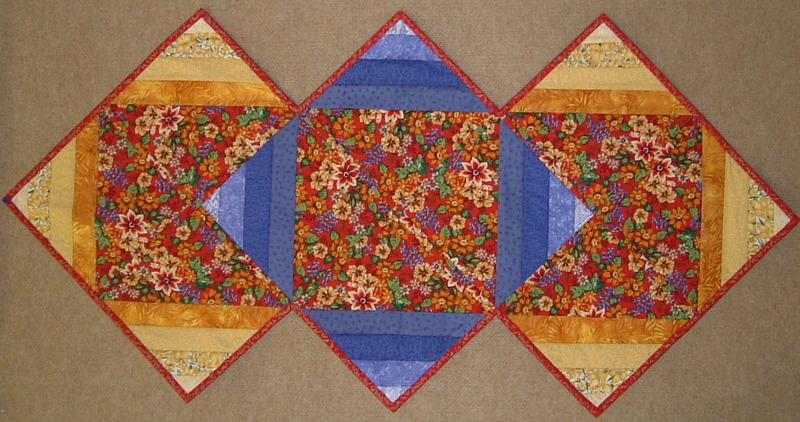 The end result can vary with different arrangements of blocks, and is a fun quilt in scraps or a set colour plan. For those with fancy machine stitches, you may prefer to add some of these. The wheels have different centres and backgrounds to add a lot of movement. The pattern for this workshop includes cutting templates that make this a quick project. This is a workshop that takes the maths out of creating on point squares that float on each layer of background. 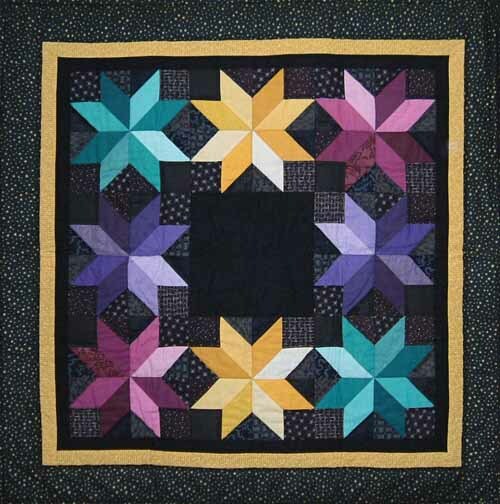 A fun block to make using scraps, or choose a set colour scheme – looks great either way. 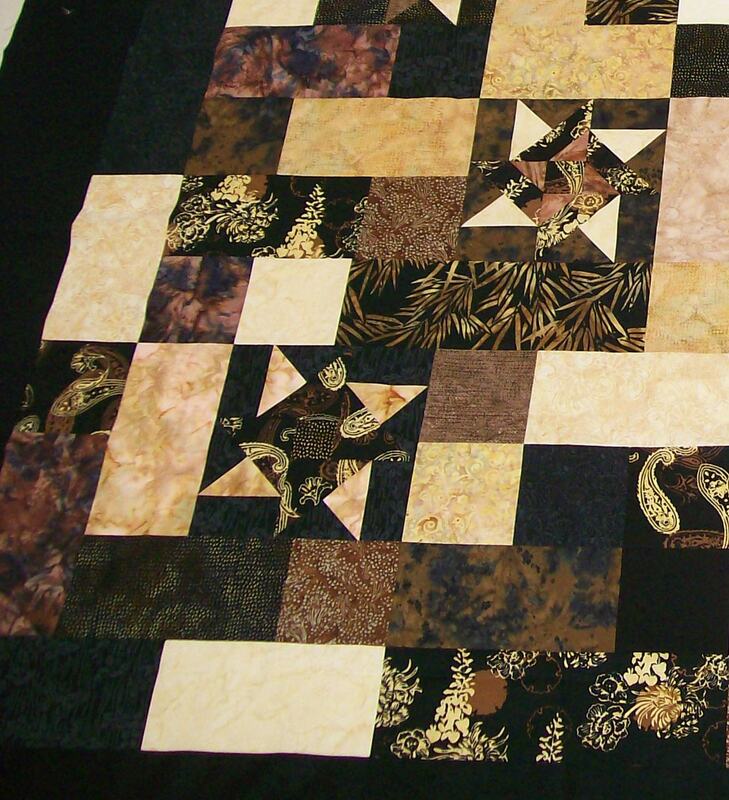 The quilt also covers a pieced sashing option and different block sizes will be discussed. Requirements are given for a single bed or large lap size quillow, and the workshop covers the construction of the traditional block design and pillow section. A great design for men and boys made in bold colours or equally as effective in soft feminine colours. A great idea for guest rooms or travelling. 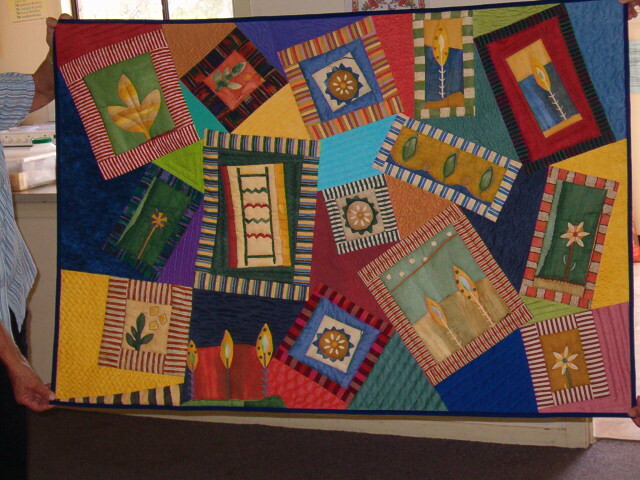 A workshop using rotary cutting skills and different piecing methods. This workshop is another favourite for scraps in strips and has been finished with an appliqué vine. The whole top will not be made in the workshop, but you will be well on the way and can add to it as time permits (or as you acquire more scraps) at home. This workshop is suited to all skill levels.